There are now over 100 Rwandan community leaders using TFT to treat members of their communities, members like Jean Pierre and Kamal. The mission of the TFT Foundation, a 501(c)(3) nonprofit organization, is to spread the use of TFT and its profound benefits throughout the world. Many Rwandan and Ugandan therapists are already trying to help us do that. The TFT Foundation has developed and proven a model that can bring TFT training to any traumatized community, where the leaders can be trained to help their fellow countrymen. In three random controlled studies (two in Rwanda and one in Uganda – one published and two being prepared for publication), the results have been highly significant. Two-year follow-ups have demonstrated that the results not only last, but the symptom reduction improves over time. The Foundation has documented the changes and healing of this region in Rwanda, and the beginning of the healing process in Uganda, over the last six years. 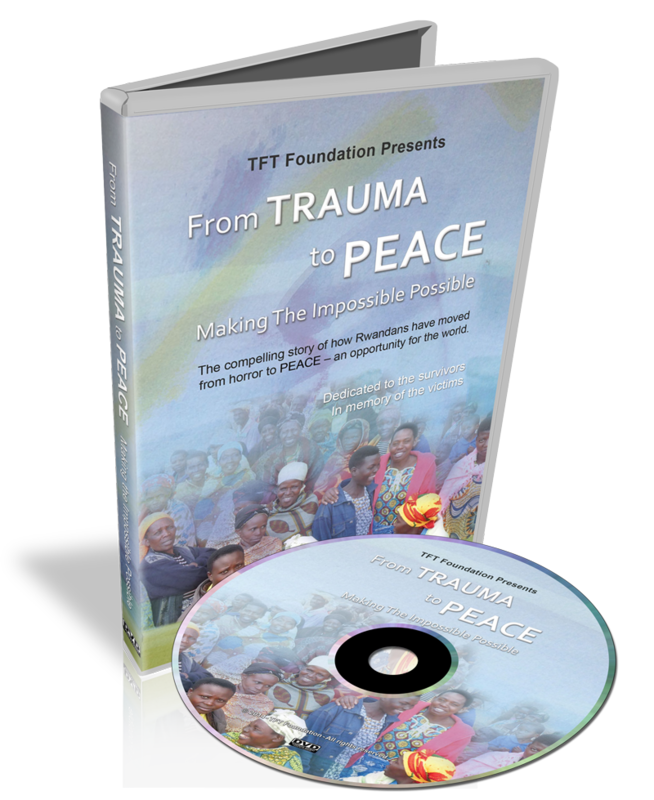 The completion of the documentary, “From Trauma To Peace,” will enable us to share this model of healing trauma with many more regions of the world. The film will be of the quality needed for PBS and film festivals. Order for Only $24.95 – Free Shipping! Jean Pierre, a Rwandan man, was forced to watch his wife and children being massacred. He was then attacked himself and left for dead. He bears the wounds from the machete on the back of his head. He heard about the miracle tapping the orphans were doing and came to ask for help. He too had nightmares and flashbacks for over 12 years. One of the therapist team members tapped with him, and he too got over his nightmares and his anger and hatred toward others. But the real telling change was not just relief of his suffering, it was his spiritual transformation. Three days later, he attended a church service at the orphanage where he said he had been given the gift of healing, and he volunteered to take three orphaned children into his home and raise them. He had his life back and was now reaching out with love and forgiveness. Please help the TFT Foundation continue sharing and expanding this transformational healing on a global scale. This film will help us create the awareness that entire traumatized communities can help themselves and others end suffering. The film and its distribution will serve as a way to raise money to help the Rwandans, Ugandans, and others use TFT to help their countrymen. Your donation will go toward the completion of the filming, editing, promotion, and distribution of this important documentary. Additional funds from the campaign will go directly to the centers actually helping the people, assisting them to become self-sufficient and productive. People CAN break the cycle of violence and feel hope and joy again. Please help us in our efforts to bring peace to our world, one person–and one community–at a time, through TFT.